Heat oil in a large skillet over medium. Season chicken with salt and pepper and cook, skin side down, until skin is lightly browned and crisp, 8�10 minutes. Transfer to a plate. Add kaffir lime leaves (if using), cinnamon, cardamom, star anise, coconut milk, coconut sugar, and reserved knotted lemongrass to skillet. 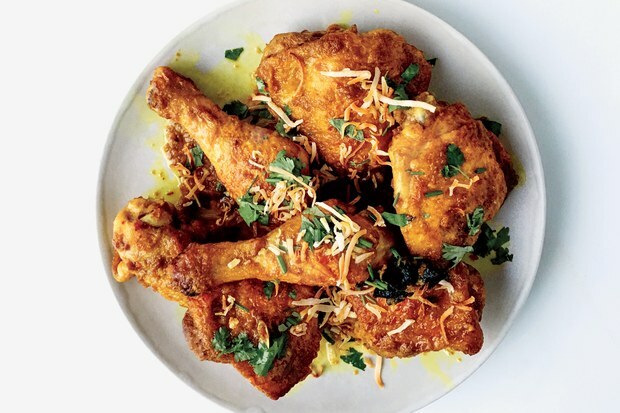 Bring to a simmer, add chicken, and cook, turning pieces occasionally and scraping bottom of skillet often, until chicken is falling-apart tender and coconut milk has broken (the fat will separate from the liquid and start to brown the chicken and other aromatics), about 1 1/2 hours.